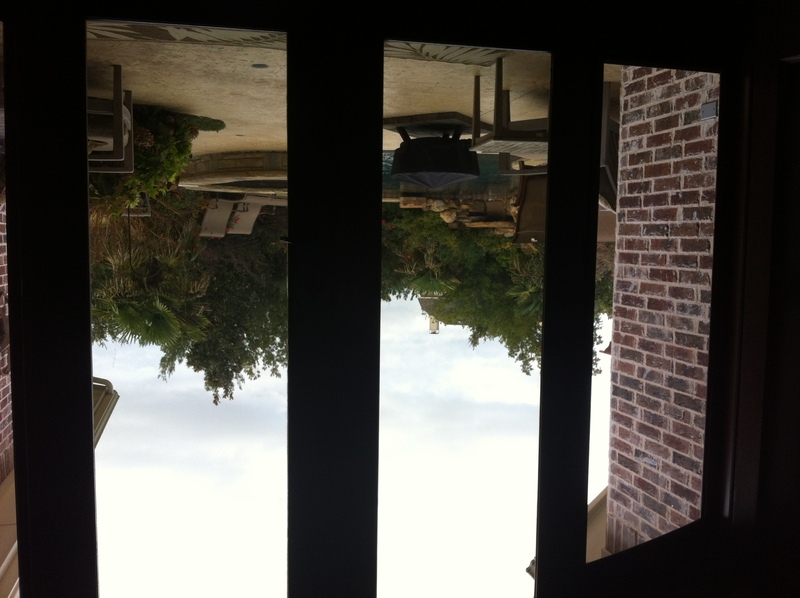 It’s somewhat of a dreary day today in north Texas, although the temperature is pleasant. It makes me happy to see the knock out roses still in bloom here on the sixth day of November. They didn’t like our harsh summer but are flourishing in our mild fall. Of course, the low temperature is supposed to be in the 30s and 40s by mid-week, but I will enjoy them while they persist. 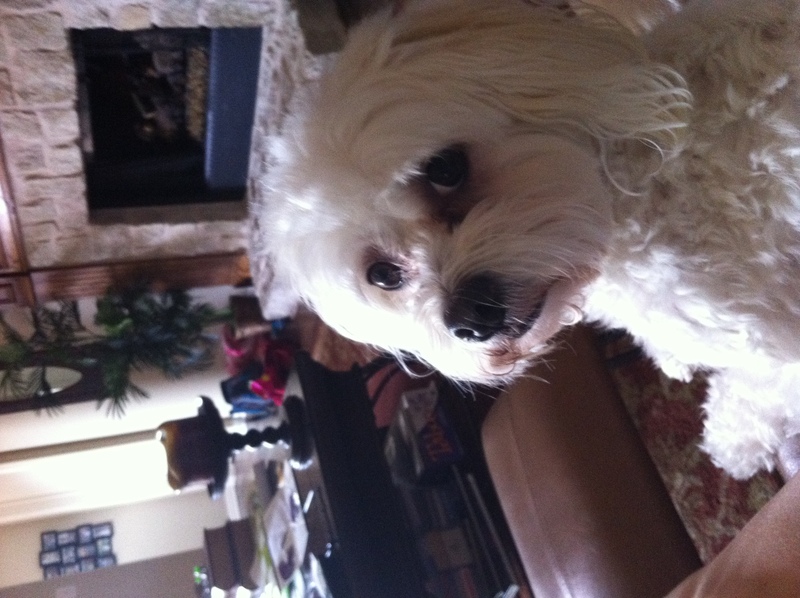 This little baby doll has been attached to my hip ever since I got back from the hospital. She follows me everywhere and is not content unless she’s either snuggled right beside me or, preferably to her when I don’t have a book in my lap, in my lap. She really is a girl’s best friend. I beg you to ignore the messy coffee table in the background. And, if you were here, I’d ask your pardon for me still being in my jammies. I changed out of the ones I wore last night and put on clean ones. Does that count? My dear husband has been the domestic king this weekend. Clean laundry is on the docket. The kitchen is clean, and at this moment he’s out buying groceries. So why is my soul downcast? I am twelve days post-op and am itching to be six weeks post-op. Not to mention itching in general where the steri-strips are a hair away from falling off too soon. Being a lounge lizard has been delightful, up to a point. I’m an independent kind of gal, and it is frustrating beyond belief to be stuck on the couch when all I really want to do are things that I can’t do yet, such as baking cookies when I get a craving…using my grandma’s cast iron skillet…walking upstairs to watch a movie on the big screen…taking a bubble bath…going for a drive by myself…and especially, going to church. Everybody says to give it time. So I will. May the Lord grant me peace so I won’t get mad and just decide to overdo it anyway out of frustration. I eat something because I don’t want the medicine to go on an empty stomach and make me nauseous. I sit and look at the pill. An hour later I eat something else because too much time has passed. I put water in my mouth. At this point my hand is shaking. I pick up the pill. I put the pill down. I look up side effects on the internet. I cry. I eat something again. I pray. Quickly, before I lose nerve, I get water in my mouth, pop in the pill, put more water in, tilt my head back, and swallow quickly and carefully. Then I open a piece of gum to quickly remove any flavor. Next comes the panic attack as I wait for any digestive or other symptoms to make their presence felt. Usually I stick my nose in a book to distract myself from the panic and the pill. If I feel even a twinge…I follow the same ritual the next time I have to take the pill. Folks…that’s just for ONE pill. It’s okay for you to laugh. I would laugh too if it wasn’t me. Never have I wished I was someone else, so much. One time I had an infection that required me to swallow four pills at once. I did my four-hour ritual and got them down and then experienced the most intense stomach cramping I could remember. It lasted several hours and was miserable enough to make me hesitate to take ANY antibiotic. So…for me to casually pop twelve pills a day down my throat….will take a miracle. Literally. Please pray for me to do the right thing. And for there to be an alternative therapy for me. I want to be well. But at what cost? I’ve been keeping my mind busy with books, movies, and politics. Well, the politics part just makes me mad, so I haven’t spent too much time there except deciding that I’m throwing my support behind Newt for the Republican nominee. His intelligence blows me away. We’ve endured several years with mental lightweights at the helm of our nation — on both sides of the aisle. I’m not saying I could have done a better job. I’m not Mensa material. But being married to an innovative type of guy makes me prone to favor innovative types of candidates. Whatever we’ve been doing these past years, is wrong. We will not be a great nation again until our people value work, not handouts. We will also not be a great nation until our corporations start treating employees like family again. There’s more to life than the bottom line, and there’s also more to life than paying people for not working. I like Newt’s ideas in just about everything except on education, but I believe he’s the type of person who is open to great ideas from all sides. I’ll write more about my own innovative education ideas later. Stay tuned. As far as books go, I found Georgette Heyer’s Beauvallet to be a delightful read! An adventure set during Queen Elizabeth’s reign, this novel took me from the Spanish waters, to London, to France, and well into interior Spain. Piracy, sword fighting, romance, bandits, running from the Inquisition…what more could a girl want? In fact, I liked Beauvallet so much that I ended up watching The Black Pearl for more swashbuckling adventures. Yesterday I read I Am Number Four, cover to cover. An easy read does not mean a fluffy one. I’m a science fiction fan, so the alien subject matter was intriguing…so much so that I’m planning to read the second book in the series. I want to see how these characters develop as they mature. My daughter has latched onto the book and is now on her way, when she’s not writing her own. I know there’s a movie by the same name…not sure I’ll watch it. Sometimes movies ruin books. One of my nephews turned our family on to Chuck a few years ago. Now we are hooked! Season Six began two days after my surgery, but we record every episode, so I haven’t missed one minute. For those of you “in the know,” this season Chuck no longer has the Intersect. No, that’s INTERSECT, not INSECT. If you don’t know what I’m talking about, you’ll have to watch it beginning with Season 1. I’m not happy with Morgan’s “zooming” but suspect that soon the Intersect will be removed from Morgan’s brain and once again placed in Chuck’s. Or maybe his sister’s. If what I just wrote sounds like gibberish to you, go get Season 1 of Chuck. Watch it. Five seasons later, you’ll hang on Friday nights just like the rest of us. 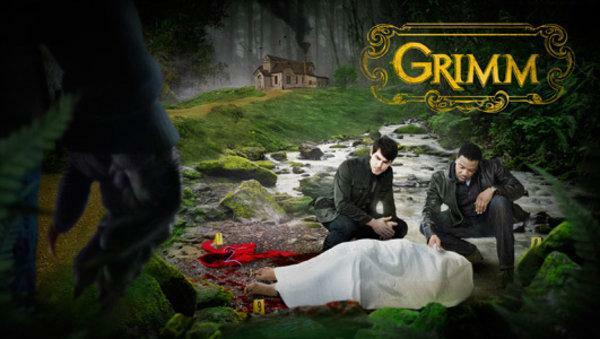 I’ve only seen the pilot episode of Grim, but so far we’ve been intrigued by the science fiction/fantasy meets crime drama. We plan to record the next few episodes to see if it still catches our interest. 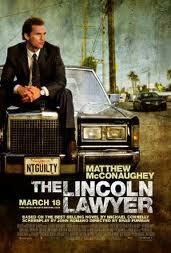 The Lincoln Lawyer falls into one of those love-to-hate movies for me. I read the book years ago…I’m a Michael Connelly fan. Matthew McConnaughey plays Mick, a sleazy defense lawyer. At the beginning of the movie, my husband and I took an instant dislike to his character. But the strength of the movie is that this bad guy really does have some moral fiber, deep down. It was great to see the story up on the big screen after picturing it in my mind in the book. However…the book was better. By far. I also watched The Tourist again. It was BETTER the second time around because I picked up on all sorts of nuances that I missed in the first watching. In fact, my favorite scene where everything is revealed is so delicious and delightful that it may just rank in one of my All Time Favorite Movies, a title shared only with Pretty Woman and The Princess Bride. 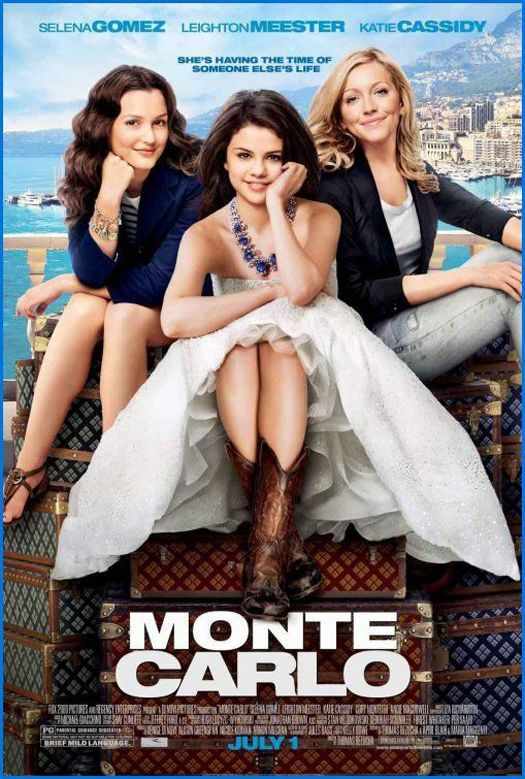 Monte Carlo was a cute chick flick that I enjoyed watching with my daughter. The thought of jetting off to Paris and then being mistaken for a rich heiress is delightful. I especially liked the way the characters came clean at the ending. It also made me dream that one day I may get up the nerve to jet off to Paris myself. So I’m staying busy doing lots of things I never really made time for before. If only I didn’t have these antibiotics hanging over my head, maybe I could enjoy them a little more. I’m still praying for the peace that passes understanding. Somehow I don’t have that this afternoon. But I’m hopeful and expectant. Surely the Lord wouldn’t have brought me this far only to desert me. In the meantime, it’s time to be a lounge lizard and get lost in another book where there are no incisions or pain or antibiotics or phobias or limits.